***New album, The Rip Tide, was released on August 2nd. Seeing that the extent of my musical talent consists of attending concerts, buying music, and spinning my thumb on my ipod, occasionally pushing pause, it always amazes me to witness someone with true musical talent. Especially when that talent shines through very early in life. 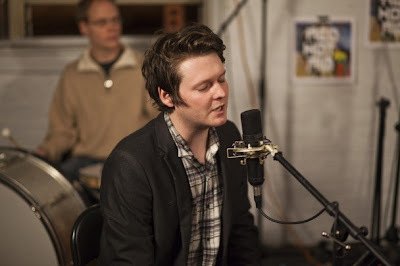 Zach Condon, was born in Sante Fe, New Mexico in 1986. Playing the trumpet in jazz band, he dropped out of school at the age of 16, and moved to Europe with his brother the following year. This is where he would become aware of Balkan folk music, which subsequently would be a large influence on his style. He would return from Europe, start his solo project Beirut, and release his first album, Gulag Orkestar in 2006, most of which he recorded by himself in his basement. This is where you will find "Postcards From Italy". HE WAS ONLY 20!!! This song was my first exposure to Beirut, and to this day is my favorite Beirut tune. Since that first release, Beirut would expand into a full band and release 4 EPs and two more albums, the most recent being The Rip Tide, which is where you will find "Sante Fe". Throughout each album, Zach brings his unique vocals, which at times I feel sounds like it could be a European singing English, as well as his skills on the trumpet, ukulele and flugelhorn. There are a small percentage of artists and bands out there that I can say are so unique that there is truly no other that 'sounds' like them. Beirut is one of these artists. Aside from the uniqueness of the sound, there is something happy and energizing about the music. It always has the ability to cheer me up, which I feel is evident in the two above videos, as he walks the streets of Paris: the way he carries himself, his smile, and his playful attitude. Both "Nantes" and "The Penalty" can be found on his 2007 release, The Flying Club Cup. Be patient with both videos, as they take a little bit to get started. For "Nantes", things get started at 30 seconds in, with the band joining in at 1:23. For "The Penalty" things get started at 1:25. Then, after entering the bar, and walking to the back, Zach is joined by his band at 2:45 in. A band I have wanted to see since the very second their music hit my ears. I can't wait for this one! Finishing up my trip to Delaware yesterday, I made my customary stop at Applebee's on my way to the airport. I can't explain it, but for some reason, no matter where I go, an Applebee's always seems to be a stone's throw away. With Mountain Dew, free Wi-Fi, and what I consider to be the best buffalo sauce around...how can you go wrong? With about 4 hours to kill, I set up camp and started searching Youtube. I entered 'Minnesota acoustic'. Mostly what came up were videos of young guys playing cover songs in the privacy of their bedroom. Amongst these many videos was an acoustic performance by Green River Ordinance at the Best Buy in Roseville. It peaked my interest enough, that I decided to dig further, and I am glad I did. From Fort Worth, Texas, their name comes from the laws which forbid door to door sales, unless the homeowner has given permission to do so. With 4 EPs and 2 full length albums, at first listen they reminded me of bands like Augustana and Parachute. However, it was their 2010 release of The Morning Passengers EP that really stood out to me. A 6 song acoustic album. This is where you will find "Dancing Shoes". There are times for me when I fall in love with an artist due strictly to their album. In these cases, if I like the album enough, it helps me appreciate the concert more, because I am familiar with the music. This will often times allow me to the cut the artist some slack with their live performance. Then there are artists, where the album or music doesn't catch me right away, or I'm left feeling it was 'okay'. But then I see them live, and it gives me such an appreciation for them and their music, and helps me hear the album in a completely different light. "On Your Own" can be found on their last full length album from 2009, Out of my Hands. The above video of a live acoustic version makes me believe that Green River Ordinance falls into this second category for me. Green River Ordinance is now on my list of artists I want to see and hopefully they will come back sometime soon. Most recently in April of this year, they released a 5 song EP titled, Songs We Like From Before We Were Born, which includes "Stuck in the Middle" by the Steelers Wheels, "American Girl" by Tom Petty and "Go Your Own Way" by Fleetwood Mac. I should also mention that they are very active with charity work. In fact, if you visit the link below, a portion of the proceeds from music purchased through this site, will go to organizations like Autism Speaks and charity:water. This morning I set my alarm for 4am so that I could pack and be to the airport in time for my trip to Wilmington, Delaware, through Philly. Everything was on track and going smoothly. I had my bags packed, and was in the car by 5:30, arriving at the airport at 6am. Then I saw the security line, and knew there might be a problem. After checking my bag, I took my place in line. 60 minutes later, I had missed my 7:15 flight. What a perfect time for a post! The next flight doesn't leave until 1pm. About a month ago, I was in the kitchen, making some soup from scratch. Like any other time I am doing something that takes more than 10 minutes, I had my music playing, specifically my playlist of songs that I've had for awhile, but not had a chance to listen to yet. "Golden Age" came on. Wow! How did I not listen to these guys before! TV on the Radio is a band that I have been familiar with as they have been a regular topic in much of the music press I subscribe too. This is probably why I never really bothered to check them out. For some reason, when I see a lot of press for a band, I tend to get skeptical. It is irrational I know, but true nonetheless. After hearing "Golden Age" from their 2008 album Dear Science, I immediately put it, as well as their newest release, Nine Types of Light on play. On my first time through there were a handful of songs that grabbed me immediately, with others doing so after a few listens. Two of those songs were "Killer Crane" and "Caffeinated Consciousness", both of which you can find on Nine Types of Light. I think these three songs show the range of their music. From the poppy spaciness of "Golden Age", to the mellowness of "Killer Crane", to the rock on "Caffeinated Consciousness" reminiscent of INXS. At this point, I only own the two albums, but will definitely be checking out their first three in the near future. (OK Calculator from 2002, Desperate Youth, Blood Thirsty Babes from 2004, and Return to Cookie Mountain from 2006). Recently, they stopped in Minneapolis for a two night stint at First Avenue, which I unfortunately did not make due to my coming late to the TV on the Radio party. I will not be letting that happen again. However, even more unfortunate was that the shows were rescheduled from their initial April dates after bassist Gerard Smith passed away after battling lung cancer, and only 9 days after the release of Nine Types of Light. Tonight I have the opportunity to attend a show in St. Paul with a friend, that I have no doubt will be fun: The Foo Fighters. I've always gotten a kick out of Dave Grohl and think he is a great showman. As much as I am, and have been, looking forward to this show, part of my heart will be in the neighboring city of Minneapolis, at the Aster Cafe. Not long after I purchased my Foo Fighters tickets, I found out that the Milk Carton Kids would be performing the same evening. My first exposure to the Milk Carton Kids was when they opened for Joe Purdy earlier this year at the Varsity Theater. If you haven't yet, check out my post HERE from May. In that May post, I mention the fact that the Milk Carton Kids proved to me once again that it is an absolute must to catch the opening act. In that instance it was because the Milk Carton Kids went from not being on my radar at all to being in regular rotation on my ipod. In this instance, it is because I am familiar with the opening act, and feel that he is equally as talented. Born and raised in Grand Forks, North Dakota, Tom Brosseau released his first album entitled North Dakota in 2002. Since then he has released 7 more including a live album. A lot of albums to choose from so I will make a suggestion and say start with his 2006 self titled album, which to date is still my favorite, and was where I got started. I encourage you to check out the songs "No Reason", "I Have Been a Prisoner, O Lord", and "Yodeling For You". 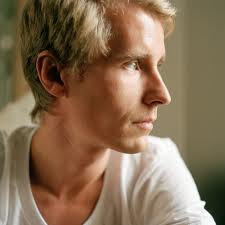 Brosseau is a mixture of indie folk and blue grass, which is evidenced by the video above of him walking the streets of New York performing "Amory", off of his 2007 album Cavalier. Most recently, Tom teamed up with Angela Correa to form Les Shelleys. 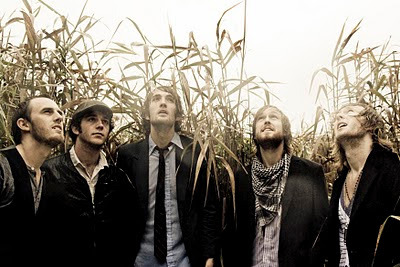 Together they released their eponymous album in 2010. I love these two videos I came across of Tom and Angela, and think their voices sound great together. However I must note, both of these songs are not on the Les Shelleys release, and can be found on his 2009 release, Posthumous Success. Compact Disc, or vinyl edition of music straight from me. Why not give it a try. I always find time. I do. I like to hear from people, too. Yours true, TB." I love musicians that like to interact with their fans, and it was seeing this on his page that made me even more disappointed I will be missing it. In fact, I will be writing him as soon as I'm done with this post. In the summer of 2007, I had the opportunity to travel to the Hyalite Mountains in Bozeman, Montana. My friend Travis and I thought it might actually be fun to ride our mountain bikes in the actual mountains as opposed to the 'bunny hills' we have here in Minnesota. Driving through the night with our bikes in tow, it would turn in to a weekend full of long, grueling rides. Rides that I will never forget. What made the long weekend even more memorable was attending the 2nd annual Storyhill Fest. Storyhill Fest is a festival built around the duo Storyhill, whom I posted HERE and HERE back in January. Prior to their headlining performances on two evenings, there were performances throughout the day by fellow label mates or artists that they would consider their 'friends'. This is how I came across Aaron Espe. Unfortunately, I didn't get to see his actual performance. Due to our biking schedule, we didn't get back to the camp in time. What I witnessed was something even better. Each night, around a big bon fire, they had what was basically an open mic format, with no mic. Unplugged. The artists that were in attendance would bring their guitars and play requests, covers, and each others songs. Aaron played a cover of a Beatles song. It was amazing! I was so blown away by his voice, that I didn't need to hear anything else. My mind was made up...I loved this guy. The next day, I purchased his 2005 release, My Whole Life, which was his only release at the time and is where you will find "Melody". To this day, it remains in regular rotation, and when I'm in an Espe mood, I will have it on repeat for 2 to 3 days. My Whole Life is one of those albums where you can't wait for the artist to release more material. Thankfully it wasn't too long, and in 2008, Aaron released Songs From a Small Town, which is where you will find "Faith & Doubt". Again, an album that finds itself on repeat on my ipod. Over the last handful of years, Aaron has released a 7 song Christmas EP, two singles, and just recently in July a 3 song EP with his side project Haviland. With each release it solidified his spot on the top of my list of artists I desperately want to see perform. Unfortunately for me and his fans, he tends not to tour. So imagine my excitement when I saw he was playing in Chicago the same weekend I was going to be there for a Fantasy Football draft. He did not disappoint, even taking my request to play my favorite, "You've Got Me Now" with his guitar, even though it is a song meant for the piano. And what a great venue! Uncommon Ground was an equal combination of a cafe, restaurant and pub, with limited seating for 50 people. We even got to hear some new material from his side project Haviland, which takes a step away from the mellowness of solo Aaron towards something much more 'indie pop' oriented. According to friend and other half of Haviland, Michael Ayers, Haviland almost didn't happen. With both artists relocating (Ayers to Seattle and Espe to Nashville), the 1,000 mile distance made it difficult. After sending some ideas back and forth, "Hurricane" is where it started, and is the opening track on the new 3 song EP. I am so excited to see where Haviland goes and can't wait to hear what they release next. On top of witnessing an amazing performance, I had the opportunity to speak with him afterwards. We talked about life, the music business, and what struggles artists face especially when it comes to creating music, as he is currently working on his third album. Aside from being a talented writer and musician, Aaron is very modest and very humble. It is almost like he carries himself with an attitude of 'I'm not that big of a deal.' Well, with that statement, I completely disagree. 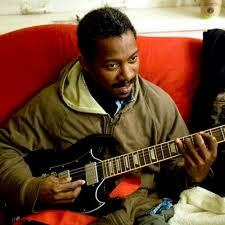 It is my opinion that everyone should have Aaron Espe in their music library. The more people that have him in their library, the more resources Aaron will have to put into making new music. It is simple economics. Visit Aaron's website and contribute to his next album. Go to itunes and download the music. And above all else, please share this post with your friends. The world needs Aaron Espe to make more music.